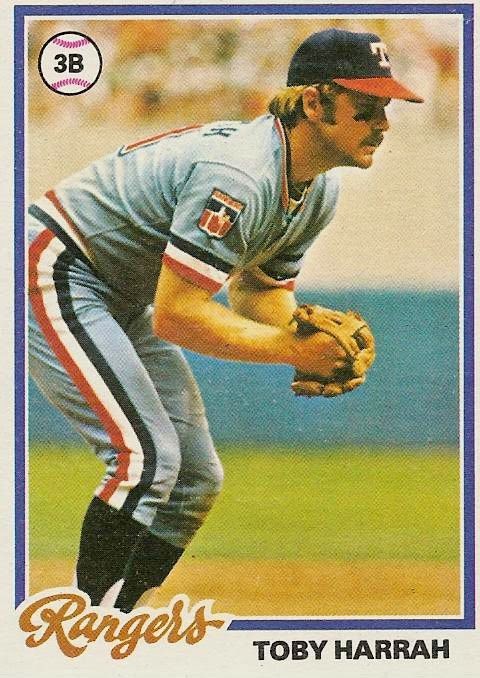 Texas Rangers Cards: 1978 Topps - Toby Harrah. Toby Harrah, shown here on card 44 of the 1978 Topps set, was coming into his junior year as a third baseman after making the switch from short stop in 1977. He had responded well to the switch in 1977 and the Rangers were hoping he would continue his star performance in 1978. Harrah played in 139 games in 1978, 20 fewer than the previous season. This was probably due to a trip to the disabled list. 91 of those games and 771.2 innings were at third base. Toby put together a .965 fielding percentage there, eleven points higher than the league average. With Bert Campaneris' struggles, Texas saw a hole opening up at short stop. Harrah got moved back to his old position in 49 games to try to fill the breach. Over the 413 innings he played at short he managed a .988 fielding percentage, 24 points higher than the league average. Toby also made 547 trips to the plate for the Rangers in 1978. He watched his batting average fall 34 points to .229 and his on-base percentage tumble 44 points to .349. That was his lowest batting average since the team moved to Texas. Harrah's power also dropped as he hit 17 doubles, three triples, and 12 home runs - drops in all three areas from the previous season. He did steal 31 bases while getting caught just eight times. That was four more steals than in 1977 but he also got caught three more times. Toby Harrah saved the Rangers defensively at short stop and third base but the unexpected offensive dip raised concerns. A shake-up was coming after the Rangers second straight second place finish. Harrah's offensive troubles could put him on the table. Even if they didn't, he needed to figure out a way to get his bat back up to where it had been over the past three or four seasons.